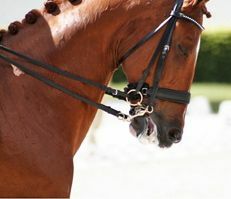 If a horse associates the bridle with discomfort or sees it as a threat in any way this can be considered to be a bridle problem. Preventing such problems developing is easier than resolving them, so a sympathetic handling approach and attention to comfort are the most important steps you can make. Refusing to allow headpiece over the ears. 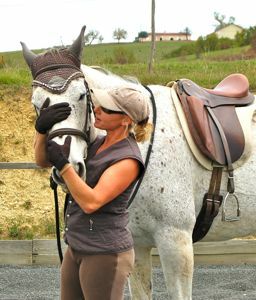 Knowing how to prevent bridle problems depends, of course, on understanding what causes them. Thinking of these habits as being 'just how he is' or putting them down to him taking advantage, is neither helpful nor truthful. Finding the real reasons behind bridle problems so often encountered with horses demands that we try to put ourselves in their shoes. Horse behaviour is dependent almost entirely on how horses feel in their body at any one time. This might be directly as a result of what is happening to them at that time e.g. wearing a bridle which pinches and hurts, but horses can also make negative associations as a result of a traumatising experience which causes them to feel things indirectly e.g. fearing the bridle because when they wear it they are ridden forcefully. 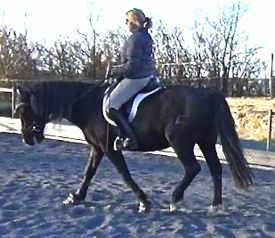 Indirect associations can be confusing for owners, who may then suspects that their horse is being recalcitrant or even 'faking'. Going on the premise that if horses feel good they will accept what we do to them and with them, bridle problems must only arise when they stop feeling good, and that usually means discomfort, pain or fear. The mild reluctance a horse, like a person might have about going to work is not strong enough to result in bridle problems such as bridle phobia or bad habits when ridden. Phoenix (photos, left) was a four year old when we bought him, and we were told he hadn't done any training yet. We assumed that he was uncatchable and very shy of the head-collar at first because he had hardly been handled. backwards when he panicked and couldn't break free. 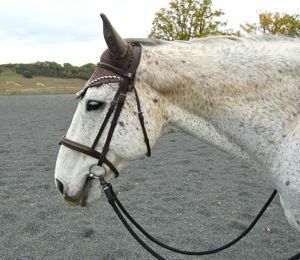 It took many months to regain his trust, but once he accepted it, there were no bridle problems for almost ten years. As can happen when a traumatic event has happened in early life, the issue resurfaced a few years ago. At the time he was being tacked up by someone different, but certainly not for the first time since he regained his confidence initially. Maybe something in the way he was being handled triggered his old feelings, or maybe he was finally ready to deal with the original trauma. He had been gradually 'unfreezing' over that ten year period, getting back in touch with his body and building physical and emotional resources and now he was able to truly re-pattern his central nervous system rather than just dissociate from the experience. This time we understood better how to approach the bridle problem also, so we could help him to overcome his trauma without re-traumatising him and losing him again. These photos show how, with patience and care, he is now able to accept a bridle without panicking. 1) Un-handled and frightened of anything new (not a problem with the bridle itself but the whole situation and everything in it). having been exposed to aggressive and bullying riding technique using bit/spurs/whip/gadgets to cause pain or discomfort. Riding can still be traumatising for a horse without any of these auxiliary aids of course. having been asked consistently for too much, either going on for too long or asking for too much energetically, or both. 4) A horse may have a physical problem which makes working unpleasant or even intolerable. It may even be unrelated to the work or a result of long term effects from the work. It may also become apparent as a result of the suppling process of correct gymnastic work. 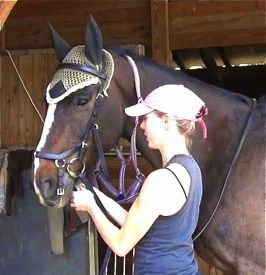 This horse (right) is wearing a Micklem Multibridle which ensures that no discomfort is caused from pressure points, and also protects his mouth from bit pressure. Equally importantly, he is ridden in a sensitive, non-forceful way that avoids bad associations with the bridle. The first sign of a bridle problem developing is when your horse reacts to the appearance of the bridle in a bad-tempered or anxious way. Listening at this stage will boost your horse's trust in you and minimise the repercussions. Bridle fit is crucial. The bit is of particular importance as it contacts such sensitive areas. The Micklem bridle has been conceived for comfort and practicality. We have found our horses accept it well and they have high standards! There is never anything to gain by tightening a nose-band enough to cause discomfort. Control which must be enforced is only illusory and will break down sooner or later. Schooling issues must be addressed if this practice has been adopted. 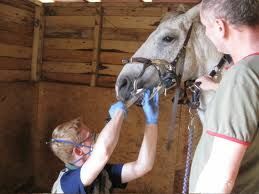 Equine Dentistry done well is particularly important for ridden horses who wear a bridle. Contact therapy: horses with hyper-sensitivity about their ears may have been roughly handled or may have an infestation of some kind i.e mites/fungal/bacterial. 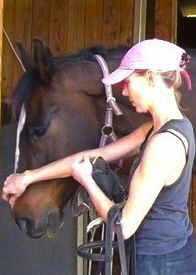 If the ears are healthy then gently massaging the roots, especially when the horse is relaxed, can overcome suspicion and nervousness surprisingly well. Be patient though and respect the horse's boundaries by staying where you can be tolerate without causing anger or fear. Positive associations: make sure when you are tacking up to make the bridling process pleasant for the horse. Stay patient and calm and instead of focusing on getting the bridle on, think more about putting the bridle on as gently and affectionately as possible. 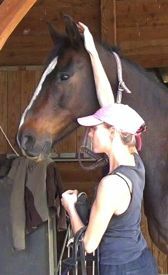 Use the process as an opportunity to communicate with your horse, just like grooming and saddling. Think of how you would feel if someone was rough and impatient with you - you might not feel in the best mood to work for them afterwards. 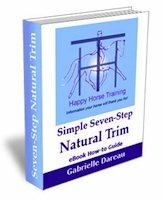 Most bridle problems related to handling arise as a result of roughness on the part of the handler which in some way traces back to fear. Some people are happy to admit they are nervous of horses, and some not - but the fear is not necessarily related to the animal. Many people feel pressurised and therefore fearful about time, progress or unrelated things in their lives. If you can treat your horse time as a therapy then not only will you avoid bringing all the negative concerns into your horse's life, you will also bring a more positive vibration into your non-horsey life. Bridle problems which surface when you are riding are equally highly likely to be as a result of pain, fear or both. Remember that comfort for the horse = control for the rider. Trying to control a horse by means of pain i.e. severe bits, gadgets and severe nose-bands will only make the horse tense which makes the horse more dangerous and more likely to react violently. A relaxed, happy horse is much safer and more responsive to the aids. One of the biggest problems about riding horses is that most people learn to control the horse with the reins, as well as balancing on them. This is at best uncomfortable for a horse, and often frightening and painful. 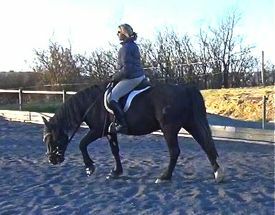 It therefore makes horses tense and less easy to control, so riders increase the severity of the pressure which increases the tension and unhappiness of the horse. It is the classic vicious circle of equestrianism, and results in either very stiff horses or dangerous ones. Riders must learn how to control the horse with their posture, and balance themselves and the horse in order to avoid any degree of the vicious circle, as well as making the horse as comfortable in his work as possible. Grinding teeth and head-shaking problems are rarely associated with the bridle, in our experience, but much more commonly as a result of pain or discomfort elsewhere. Head-shaking can be a hyper-sensitivity caused by a problem with the central nervous system, and teeth grinding is a more general expression of pain - maybe at the joint or spinal level. The first step in identifying the cause of negative reactions when riding is always to check comfort. If the bit is adjusted too low in the horse's mouth she may attempt to put her tongue over it simply because it is a possibility. It can also be a habit the horse learns to defend themselves against rough handling of their mouths in the same way as putting the tongue out can be an attempt to protect the corners of the mouth. 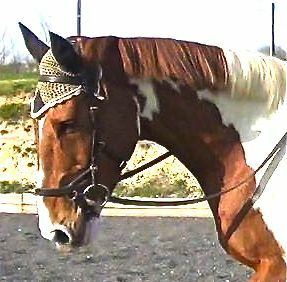 If the previous bridle problems tend to signify self-defense, then holding, pulling and tugging of the bit can be considered as more of an attack by the horse. She is using the bit to actively resist the rider. In fact there is not much difference between defense and attack in this case, except to indicate the extent of the force which has been used by the rider or how reactive the horse's temperament is. The first stage of training a horse to accept the bit may involve resistance on the horse's part. This is stage where bridle problems are prevented or formed. The answer does not lie in the bit itself or the manner in which it may be manipulated. Acceptance of the bit achieved in this way is short-lived at best, and not integrated with the rest of the horse's body. 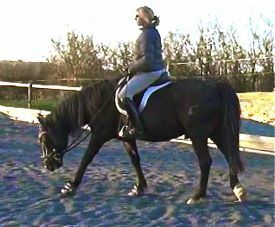 In fact acceptance of the bit happens as a result of the straightness and subsequent engagement of the postural ring of the rider and horse. In general, a horse will hold the bit if she is trying to control direction. By sucking the bit back between the teeth and gripping it, she can block the riders aids very effectively. This is not an evasion a reasonably well educated horse and sympathetically ridden would ever develop (look at section below on Curing Bridle Problems). Pulling Is an elaborate evasion. As soon as a horse ignores the collecting aids of the seat or legs asking him to come back to the rider, and the rider then allows the loss of balance to come into the reins, creating a weight (and a fulcrum) there - then the horse is 'pulling'. Tugging is a classic riding-school-horse habit, developed by horses simply to defend themselves against riders who hang on to the reins the entire time they are in the saddle, even at rest. Horses need to be able to rest their neck by stretching it out without restriction at reasonably frequent intervals throughout a session (every 5 to 10 minutes maximum). Whenever a horse is at rest they must have the full liberty of their head. Some horses will also tug to release themselves from a contact or connection which is hurting them. 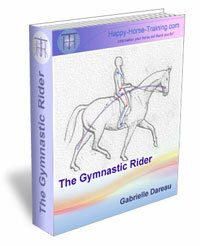 Often spinal pain particularly in the neck and lumbo-sacral junction will cause a horse to tug. If we can succeed in making the horse's mouth a place of relaxed stillness and calm acceptance where the bit is not used as a weapon by rider or horse, then we have done an excellent job. If he does it first, using postural resistance (not rein) and leg control to bring his balance out of the rein fulcrum, then giving him the reins. In the photo I am correcting his balance because he already tugged. Any kind of attempt to jerk the reins or 'correct' in any way with the reins is counter-productive in that it will reinforce the horse's original urge to defend himself in this way in the first place. It is important to understand that Rafi doesn't 'choose' to tug as such, he does it involuntarily as a result of stress. He doesn't choose to be stressed, he is like that involuntarily as a result of previous traumatic experience and physical weakness. Because both traumatisation and physical weakness/damage have been caused by his abusive training before, they cannot be distinguished from each other. Only time will tell how much is attributable to one or the other, and it doesn't greatly matter because the riders response is always to respect his personal progress. 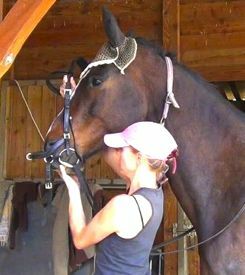 Tugging is one of the most difficult bridle problems to resolve because it comes about as a final resort. No horse does it if they have not been trained extremely insensitively. If the horse's negative reaction is still a direct response to pain or discomfort as a result of the bridle, or unsympathetic handling when putting the bridle on or off, then this reaction will change pretty much as soon as the source of the problem does i.e. if you stop causing pain or allowing it to be caused. Time. Although in fact it is the quality of your attention which matters far more than the actual length of time spent. Giving your horse your full attention gives him the certainty that you have all the time he might need. Impatience will make him curl up into himself more and more. Willingness to go about things the 'long way', so whether you are handling or riding you never force your horse's boundaries by putting whatever you had planned to do before his readiness, either physical or mental. Doing things quickly is not a sign of success. Most often it is a sign of having pushed over the horse's needs to achieve a result which might not continue to be achievable in a few weeks or months time. 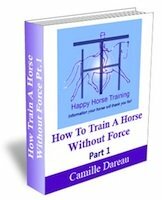 For more information about practical ways of working with trauma or handling young horses in general look at How To Train A Horse Without Force.